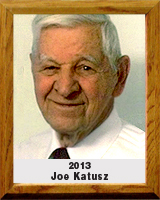 From the football fields of Wilkes-Barre, Pennsylvania through baseball fields both here and abroad to the wrestling room at Pueblo High School (Tucson), Joe Katusz’s contributions to athletics has spanned over 50 years. His athletic career began in high school on the football field in Wilkes-Barre, Pa. where he excelled in both football and wrestling. After graduation from high school he was a starter for the football team at Mansfield University in Pennsylvania. His experiences as a baseball umpire began in Baltimore County and continued abroad where he had the opportunity to umpire for military teams in Japan, Korea, France and Germany while he was employed by the U.S. government to teach children of military personnel. Settling in Arizona, he continued to enjoy a broad range of umpiring experiences, including games for the University of Arizona, local high schools and in the Babe Ruth World Series for players ranging in age from 13-18. Perhaps his greatest accomplishment was coaching his 1968 Varsity wrestling team at Pueblo High School to the State Championship. During his nine years as the head wrestling coach at Pueblo he introduced a wrestling program to Pueblo feeder schools which helped to build the varsity program to a State Championship in 1968. Joe coached over 20 high school wrestlers who would become state champions. In 1969 he was recognized by the Tucson Conquistadores as the high school wrestling Coach of the Year. A career educator, Joe strongly believed that sports provided an excellent classroom where valuable life lessons could be learned.